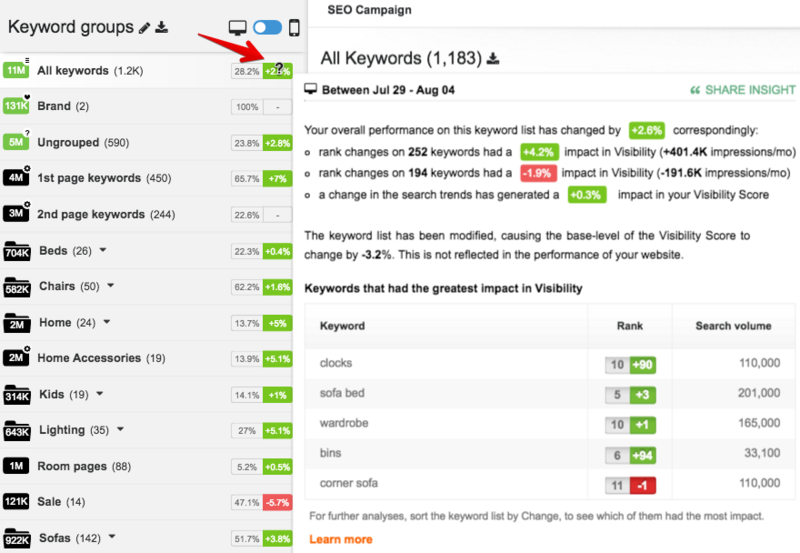 How to easily discover the most significant rank fluctuations in your keyword portfolio. There are great advantages of following the Visibility Score. But there's always the question of what caused the change in Visibility, tapping into rank changes, the core of SEO performance. Furthermore, you can explore all the keywords with rank fluctuations that impacted the Visibility. To see them, sort the keywords by change, either positive or negative. This will not sort them by the number of positions gained or lost, but by the impact of the rank changes on the overall Visibility. Some of the rank fluctuations might be connected to changes in the landing page (URL, title, description, etc. ), which can be explored in more detail on the keyword events timeline.